Learning how to grade coins with the coin grading scale is probably the most difficult aspect of coin collecting for the beginner to learn. However, it is very important to at least have a basic understanding of how the coin grading scale works. You will want to have a fairly good idea of what your coin (or a coin you are considering) is worth before dealing with coin dealers in order not to get "ripped off". If you have a basic understanding of how to grade coins you can avoid paying too much for a coin or selling a coin of your own too cheaply. Think of it as three different "mini-scales". Keep in mind that the MS scale (from MS-60 to MS-70) is a completely separate mini-scale (or category) rather than a continuation of the AU scale. This is the glossy, shiny appearance of a coin or the coin's ability to reflect light; brilliance. etc. but it IS unciculated! The AU-58 coin just beneath it in the scale, however, will be a very attractive coin with almost full luster. There is a reason for this. They are really in separate "categories" of the grading scale. On the same note, the AU scale (from AU-50 to AU-59) is a complete different "category" than circulated coins. Although the AU-50 coin has never actually been in circulation, it has probably been handled a small amount and possibly has a few scuff-marks from coin-counting machines. Therefore it is no longer Mint State. So it is put in the AU "category" as the bottom grade for that category (AU-50) if it is ugly and AU-58 if it is really nice, or somewhere in between. This is really an oversimplification, but it is meant to explain to you why the grading scale seems to jump from "pretty" coin to "ugly" coin and back to "pretty" coin again. Now let's take a look at the third "category", Circulated Coins. This category ranges from P-1 to EF-49. Most beginners learning how to grade coins have circulated coins. This just means that they are coins that have been used in public as a means of purchasing rather than coming straight from the mint. Fortunately, coins that have been in circulation are also the easiest for the beginner to grade. A Good light source - a lamp with a 75 or 100-watt bulb near where you are working. More details about lighting below in the tips section. A Decent magnifier - something that magnifies about 5 to 8 times (5x to 8x). Anything stronger than 8x isn't usually used in coin grading, but anything that is lower than 5x is too weak to see important details and small damage marks. Step 2 - Look at your coin closely and figure out which "category" it fits into. For review, it will either be MS or Mint State (absolutely uncirculated), AU or About Uncirculated (only the high points will have the slightest hints of wear) or Circulated (the most common category). Step 3 - Compare your coin to the scale to determine where it fits within its "category". (click here to open the scale in a new window) Place your coin as best you can using the written descriptions. For more precise grading, I recommend The Official American Numismatic Association Grading Standards of United States Coins . It lays the grades out in detail for every major U.S. coin type and it has photos to help you better determine the correct grade. This book is produced by the American Numismatic Association and it is a valuable reference book. No coin collector wanting to know how to grade coins should be without one. Hold the coin correctly. 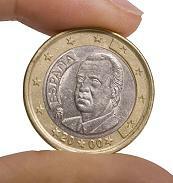 Always hold the coin by its edges, between your index finger and thumb. You can use your middle finger as a safety net in case the coin slips out of your grip. Rock the coin back and forth while at the same time turning it in a circular motion that gives the coin a full 45-degree angle. If you have good lighting this technique will enable you to see hairlines and light cleaning that you might not otherwise see. Stick with a 75 or 100-watt bulb. Usually, less than 75-watts is not going to be bright enough unless you are using a special high intensity lamp. Stay away from fluorescent lights altogether. Do not try to save money by purchasing inexpensive bulbs. They could give off a more yellowish light. Generally, keep 12" to 16" between the light source and the coin you're grading. 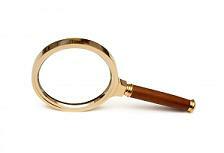 Only use a magnifying glass if you see something that needs closer inspection. If you use a magnifying glass too often you may have a tendency to place too much focus on minute imperfections which could lead to under-grading. If you grade too quickly, you can easily miss something. However, if you spend too much time stressing about it, you will talk yourself into an incorrect grade. If this happens, take a break, then return to the coin later. Experience is the best teacher and the only way to get experience is to grade a lot of coins. Here is a tip that I read about that should help you hone your grading skills. 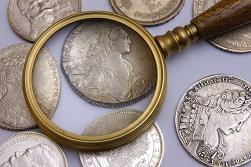 Choose one of the major coin grading services, (try to stick to just one coin grading service for this exercise) and go to places that will have coins certified by this service, such as coin shows, auctions, or your local coin dealer. Now, ignore the label completely and grade the coin. Don't look at the grade until you have graded the coin yourself. This can be a fun, challenging and educational game and eventually your grade will match or get close to the grade from the professional grading service. If your grade is higher, check the coin again. Look for minor problems you may have missed the first time. If your grade is lower than the certified grade, ask yourself why the coin couldn't be the higher grade. If you're still convinced it's graded too high or too low, keep in mind that the grading service may just grade them differently than you would. This should give you a fun and interesting way to learn how to grade coins. Fortunately, the beginner coin collector doesn't need to be intimidated when learning how to grade coins. Any person, even a beginner, can learn how to grade nearly any coin. Just take your time and read books on the subject and study as many coins as possible that have been graded by a reputable source. Here are a couple more books that are recommended for learning how to grade coins. "Photograde: Official Photographic Grading Guide for United States Coins, 19th Edition "
"The Official Guide to Coin Grading and Counterfeit Detection "